There was actually a lot on the radar today despite reporting season cooling down this week - another couple of days and we’ll be done. All up it’s been good, more upgrades than downgrades and better outlooks in aggregate. A ‘tick’ thus far. QBE was out with results and they fell -3.26% - another ‘difficult’ update from QBE despite ripping the band aid off late in January with some big write-downs (non-cash) - it’s sort of like a child that shows so much promise but just stumbles – drops the ball right at the wrong moment! More on their result later. On the flipside, some decent buying in the Lithium space today with our position in Kidman Resources (+4.55%) starting to look good while Iluka (ILU) was also strong adding +3.77% - our two best performers in the resource space, while Webjet continued to cop some buying after a very good update last week, adding another 3.14% to close at $12.15. We own from $9.54. 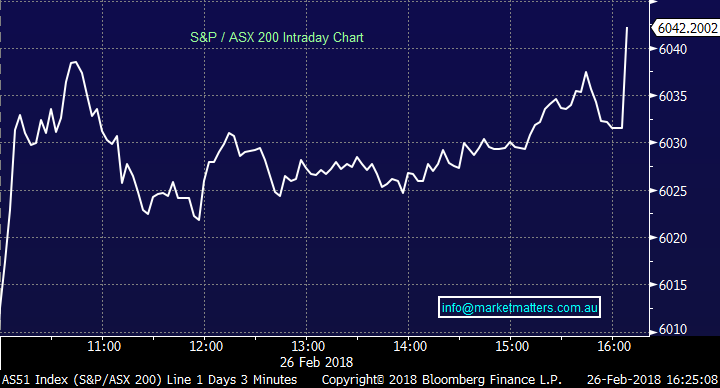 The banks are such an influential component of our market and today they found form with the big 4 contributing half the gains on the ASX 200 (+20 index points for the big 4)…which is nice and fits into our thinking around seasonality leading into April / May high. We published the seasonality chart for the sector this morning – and again here highlighting our bullish stance on the banks which started to play out last week and again on the market today. 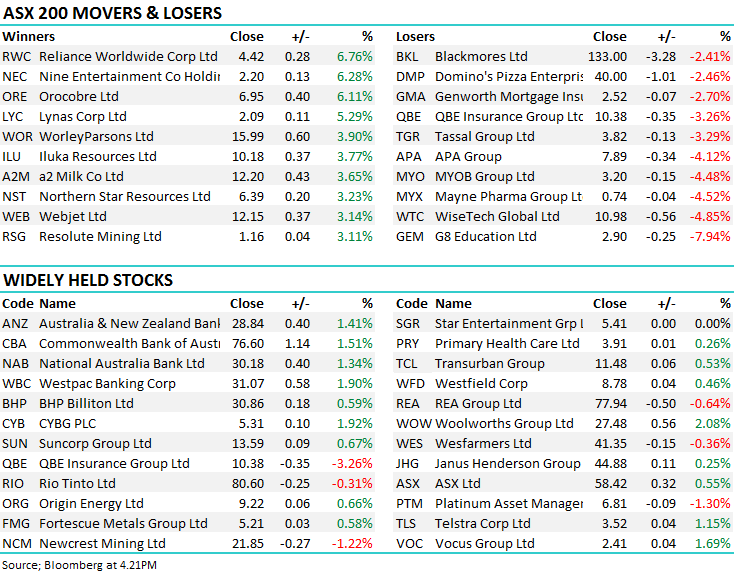 Westpac was particularly strong adding +1.90% today to close at $31.07 while the rest of the majors were up more than ~1.30% - a good result in a market that traded strongly up through the 6000 market to close at 6042 – up +42pts or 0.71%. In the Weekend Report we flagged our expectation that banks would start to outperform their resource cousins, highlighting a BUY NAB & SELL BHP trade on the belief that NAB will outperform BHP in absolute terms over the next 2-months. · In early 2016 NAB was trading about $9 above BHP, today we’ve seen an almost $10 transformation with BHP almost $1 above NAB. Today that trade put on 0.75% as NAB outpaced the move higher in BHP. QBE Insurance $10.35 / -3.26%; A stock that simply continues to test ones patience even though they pre-released numbers in January. In short, the result was a messy one and the dividend of 4cps was the main miss in terms of market expectations – however, they are starting to walk their talk. The main issue for QBE over the years has been their inability to predict with any certainty likely earnings – it’s a big business with many moving parts. Pat Regan (CEO) is now simplifying the business and the announcement today around the sale of their Latin American operation I thought was supportive of that direction. 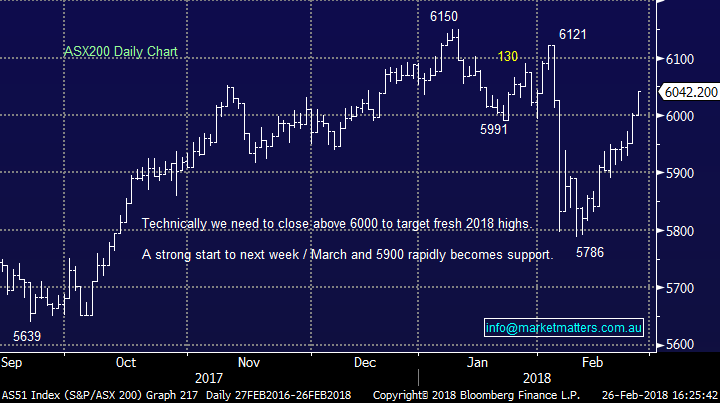 In terms of the numbers today, they were mostly known so that wasn’t the issue – it’s seems the market was of the opinion at the last update in January they may have been downplaying things – which unfortunately they weren’t. There are 2 main things that drive QBE earnings; Underwriting results and Investment returns, and both of these aspects have an improving outlook. In terms of trade today, they actually opened well in the morning, trading as high as $10.91, only to fade and close lower. 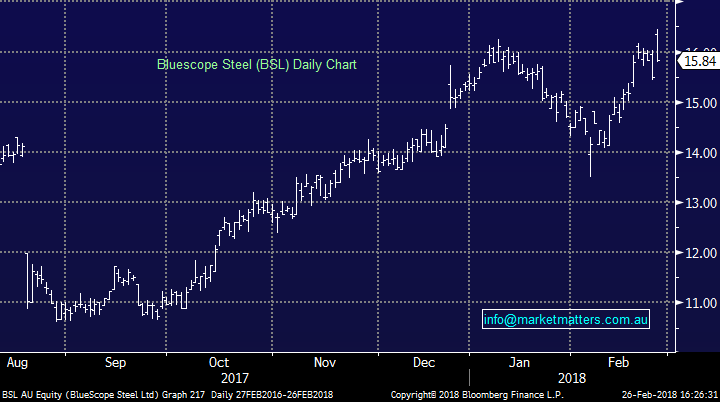 Bluescope Steel (BSL) $15.84 / 2.26%; A good set of numbers from BSL today, marginally exceeding their upgraded guidance set in December of last year – exactly what you need to do when you’ve enjoyed such a strong run in share price. They were saying underlying EBIT of $460m and delivered ~$480m today plus their guidance was good. That said, it’s very hard to get excited about BSL here. G8 Education (GEM) $2.90 / -7.94%; whacked today and this is a stock we discussed as a potential income play a few months ago but on further analysis, gave it a wide birth. They missed on most metrics and the very poor recent run for the early childhood company continued. The main issue today was not the miss in terms of profit (underlying of $93m v $100m exp) but occupancy which is still weak suggesting no real turnaround / improvement in the offing. There will be a time to buy this one, but just not yet. Silver Chef (SIV) $4.78 / -28.34%; is another one to keep an eye on after they reported results, announced some questionable restructuring, declared that they had breached lending covenants (but had secured a waiver in December) while their Auditor showed very little confidence in their books. We’re not followers of this stock however it’s never good when KPMG includes the below discloser. Silver Chef shares fell -28.34% today to close at $4.78. This one has a smell about it! !